Easy elegance. 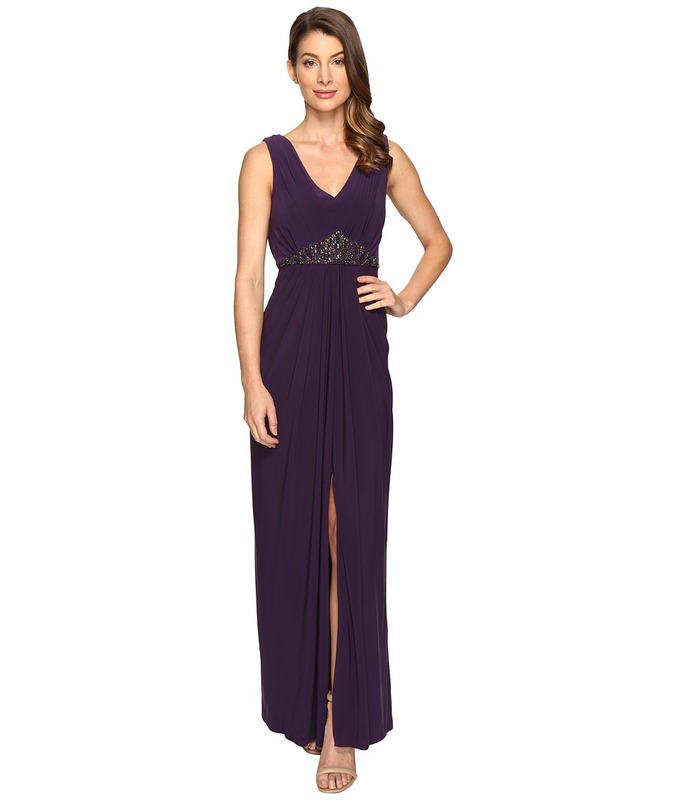 Slimming column gown flaunts a figure-flattering shirred design at the bust and waist for a Grecian-inspired finish. Soft stretch jersey drapes elegantly over the frame. V-neckline and back. Sleeveless. Embellished beading at waist. Draped overlay at back. Zipper closure at left side. Center slit. Floor-sweeping hemline. Fully lined. 96 percent polyester, 4 percent elastane Lining: 100 percent polyester. Spot clean only. Imported. Measurements: Length: 60 in Product measurements were taken using size 2. Please note that measurements may vary by size. Leave the room with all eyes on your stunning Adrianna Papell gown. 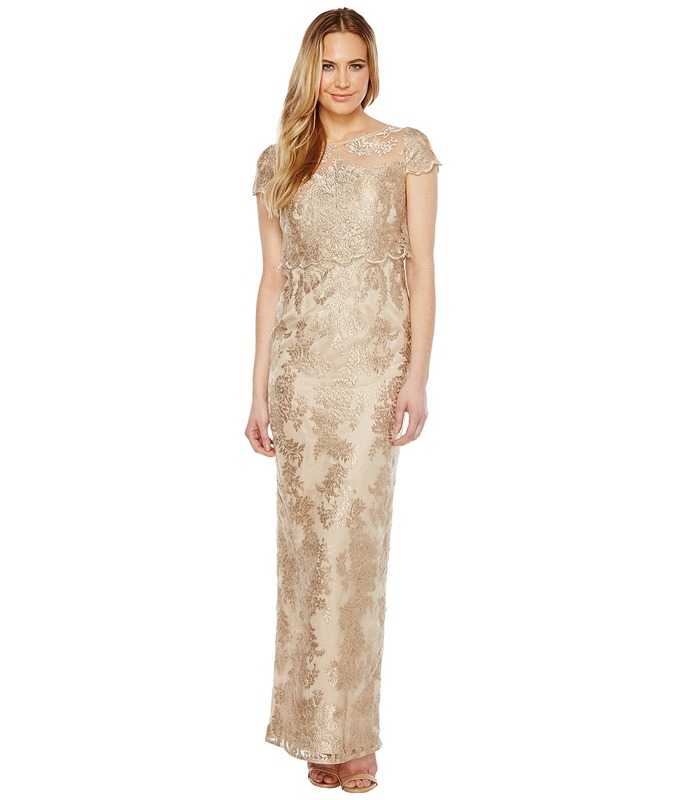 A stunning lace overlay compliments the mermaid silhouette. Illusion neckline. Three-quarter sleeves. 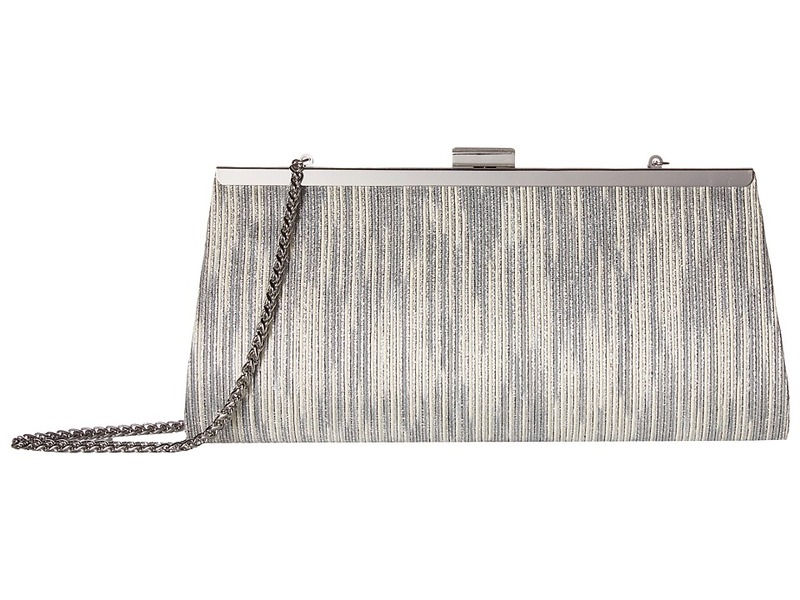 Concealed back-zip with hook-and-eye closure. Straight hem with back slit. 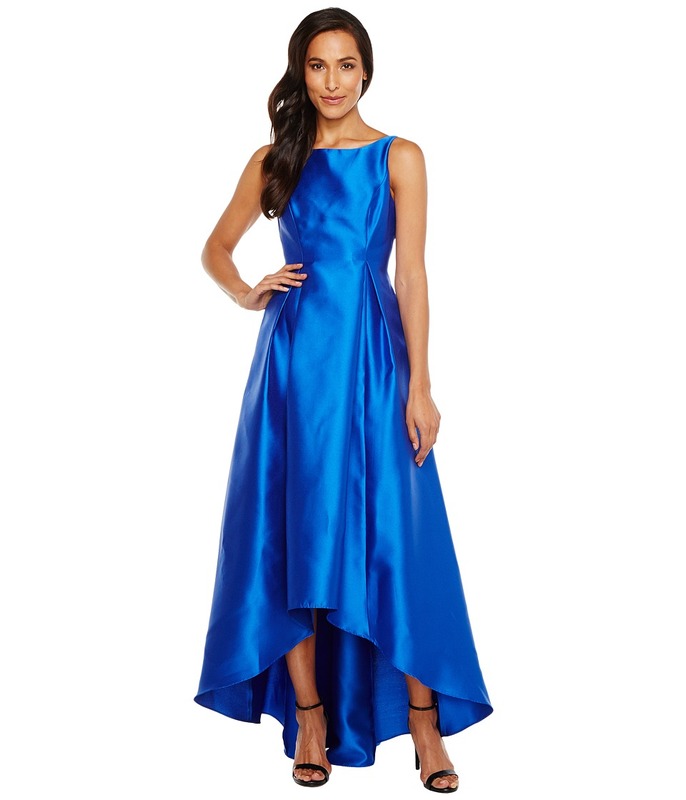 56 percent viscose, 44 percent nylon Lining: 100 percent polyester. Dry clean only. Imported. Measurements: Length: 63 in Product measurements were taken using size 2. Please note that measurements may vary by size. 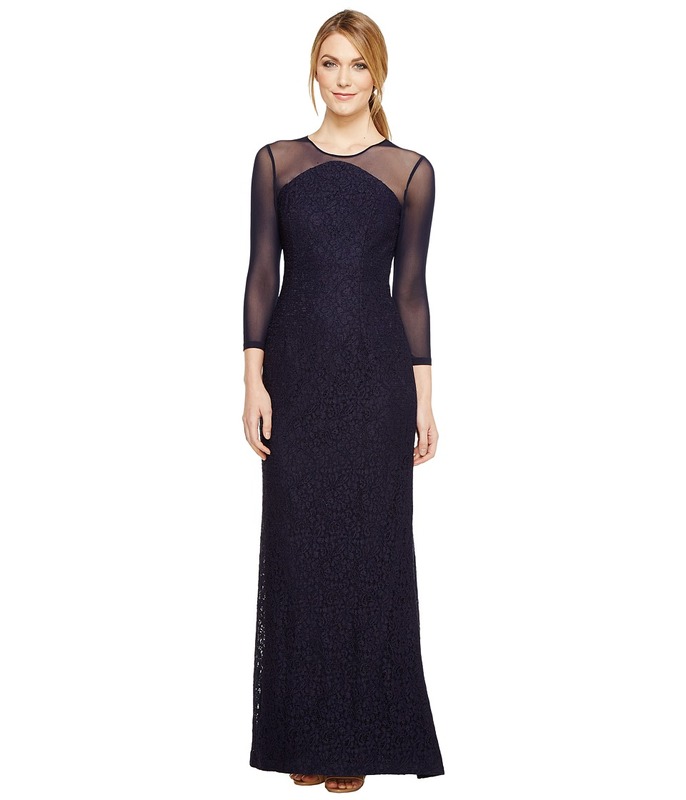 Dazzle as you dance in this winning Adrianna Papell popover gown. Stunning embroidery allover a nylon fabrication. 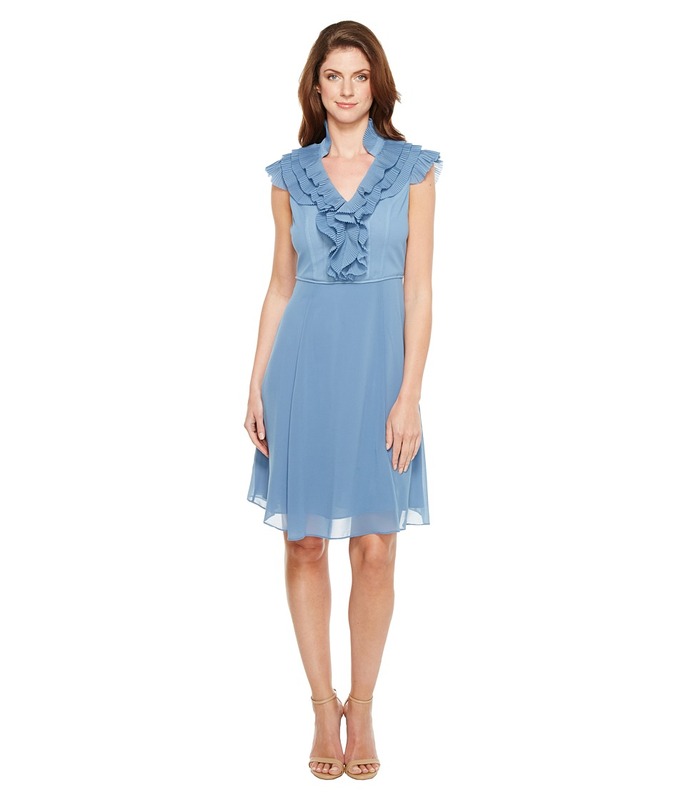 Sheer popover bodice features a scalloped hem and cuffs. Round neckline and short sleeves. Illusion yokes. Hidden zip closure in back. Slit at center back. Fully lined. Straight hem. 100 percent nylon Lining: 100 percent acetate. Dry clean only. Imported. Measurements: Length: 60 in Product measurements were taken using size 2. Please note that measurements may vary by size. You will create stylish memories in this stunning Adrianna Papell creation. 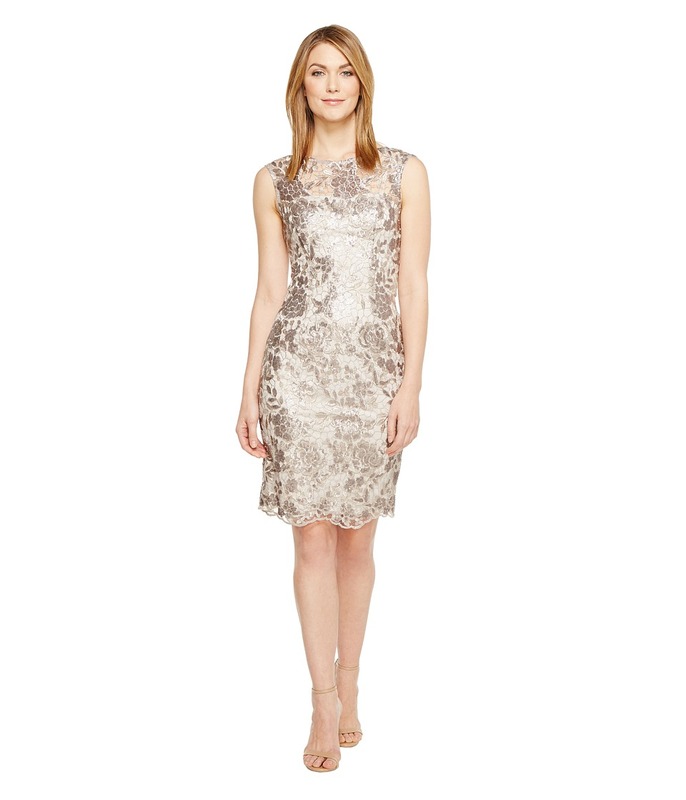 Sleeveless sheath dress features a darling sequin embroidered design throughout. Fitted bodice. Jewel neckline. 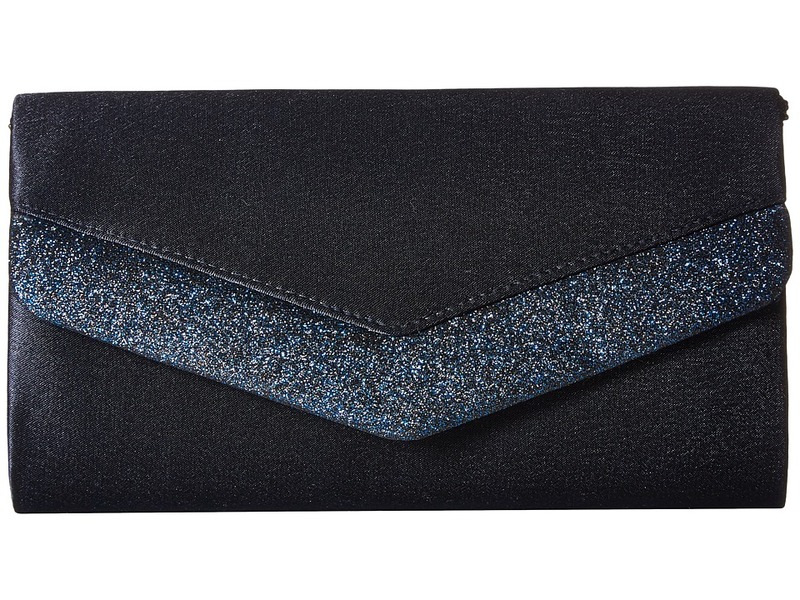 Concealed back-zip with hook-and-eye closure. Side hand pockets. Straight hemline. Fully lined. 100 percent polyester Lining: 100 percent polyester. Spot clean. Imported. Measurements: Length: 39 in Product measurements were taken using size 2. Please note that measurements may vary by size. 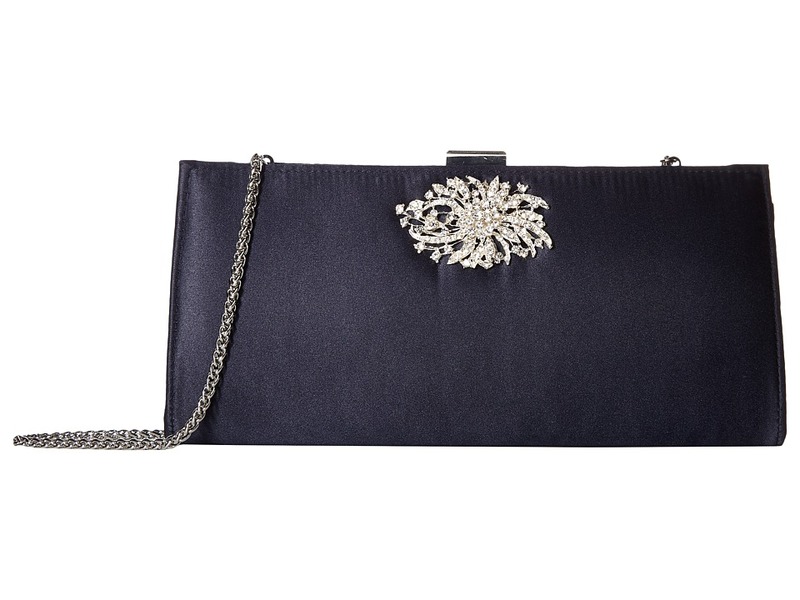 Add a touch of color to your black-tie attire with this Adrianna Papell creation. Sleeveless gown features stunning solid colorway on a fine mikado fabrication. Fitted bodice. Halter neckline and V-shaped back. Full flared skirt with delicate pleats near the waist. Dual hand pockets. Hidden back zipper closure. High-low hemline. Fully lined. 100 percent polyester Lining: 100 percent acetate. Dry clean only. Imported. Measurements: Length: 61 in Product measurements were taken using size 2. Please note that measurements may vary by size. Command attention in this Adrianna Papell dress. Fit-and-flare silhouette. Stunning embroidery on a poly fabrication. V-neckline and back. Sleeveless. Mesh overlay at skirt. Concealed zipper closure at back. Lined. Subtle high-low hemline. 100 percent polyester Lining: 100 percent polyester. Dry clean only. Imported. Measurements: Length: 40 in Product measurements were taken using size 2. Please note that measurements may vary by size. Make a bold statement in this Adrianna Papell dress. Sheath silhouette. Watercolor-striped design on a stretch-poly fabrication. V-neckline. Sleeveless. Structured seaming for a sleek finish. Concealed hook and zipper closure at back. Lined. Straight hemline. Back vent. 95 percent polyester, 5 percent elastane Lining: 100 percent polyester. Dry clean only. Imported. Measurements: Length: 40 in Product measurements were taken using size 2. Please note that measurements may vary by size. 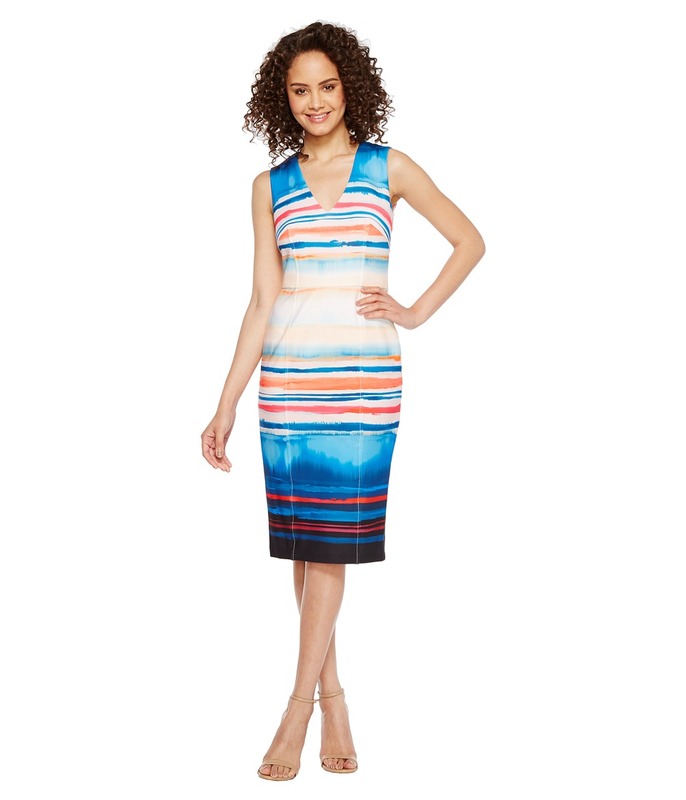 Elevate your style in this gorgeous Adrianna Papell dress. Shift silhouette. Rich solid colorway on a gauzy-crepe fabrication. V-neckline. Sleeveless. Lace detail at shoulders. Cascading draped detail at front. Lined. High-low hemline. Slip-on. 100 percent polyester Lining: 100 percent polyester. Dry clean only. Imported. Measurements: Length: 51 in Product measurements were taken using size 2. Please note that measurements may vary by size. 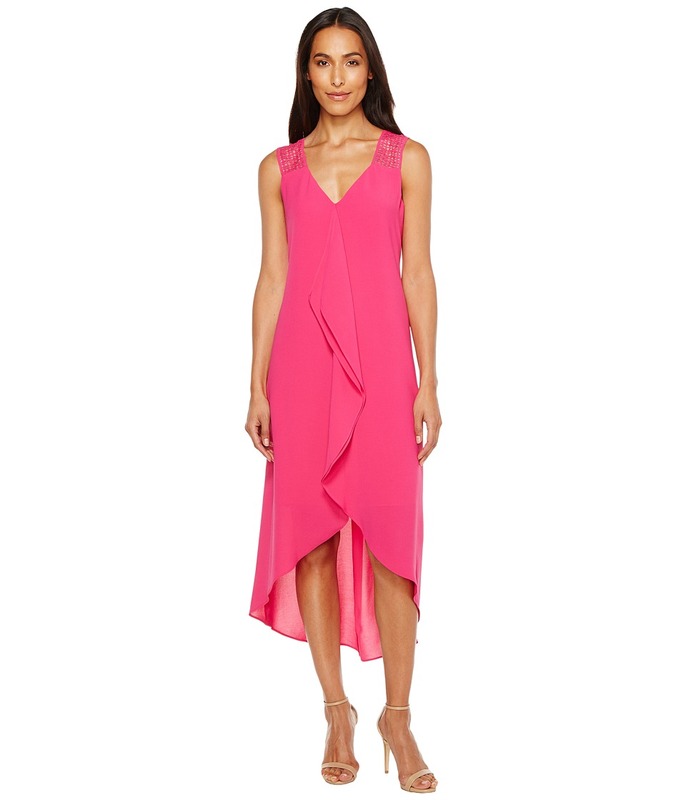 Make a bold statement in this Adrianna Papell dress. Shift silhouette features a draped overlay at front for an elevated look. Solid colorway on a gauzy-crepe fabrication. Round neckline. Keyhole cutout and button-loop closure at nape. Short sleeves. Lined. Straight hemline. 100 percent polyester Lining: 100 percent polyester. Dry clean only. Imported. Measurements: Length: 40 in Product measurements were taken using size 2. Please note that measurements may vary by size. 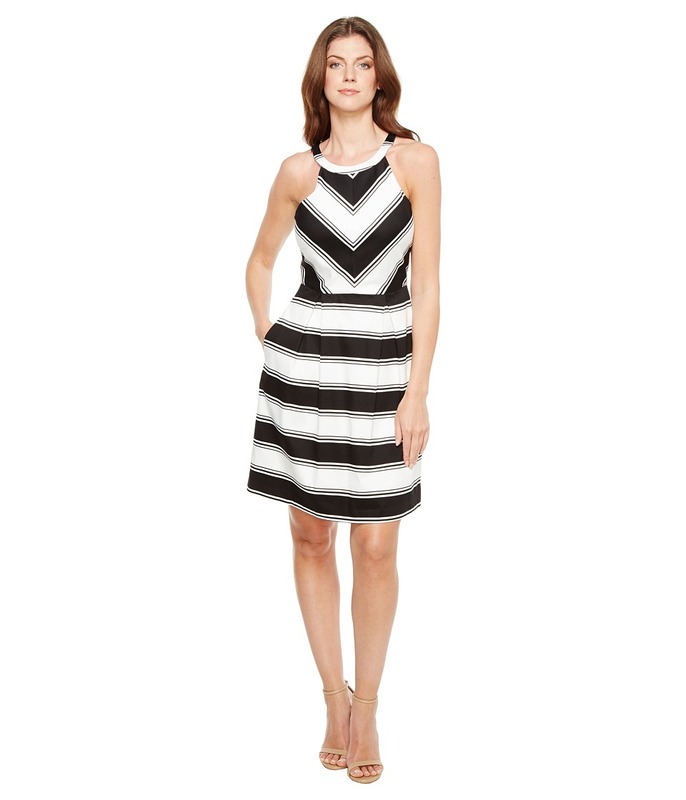 Command attention in this Adrianna Papell dress. Sheath silhouette. Rich solid colorway on a stretch-poly fabrication. Bateau neckline. Cap sleeves. Lovely drape detail at bodice for a flattering shape. Concealed hook and zipper closure at back. Lined. Scissor hemline. 97 percent polyester, 3 percent elastane Lining: 97 percent polyester, 4 percent elastane. Dry clean only. Imported. Measurements: Length: 36 in Product measurements were taken using size 4. Please note that measurements may vary by size. 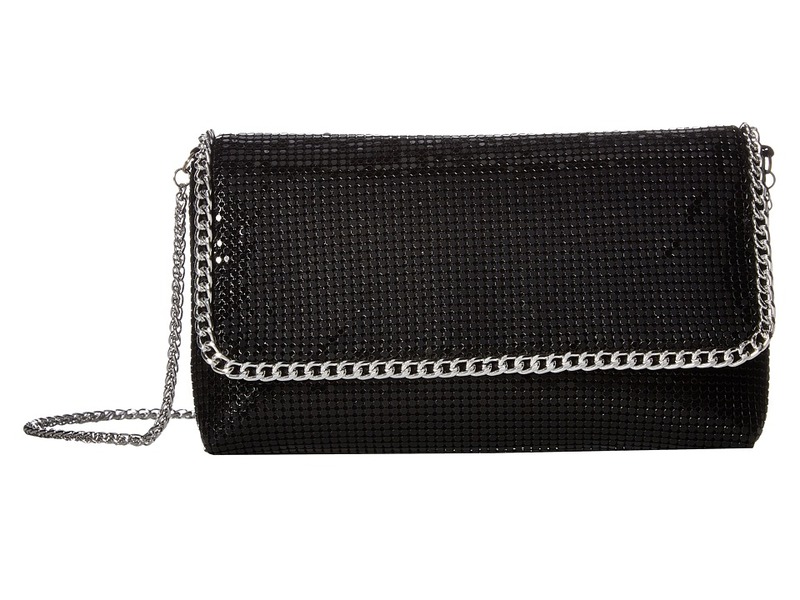 Upgrade your little black dress! Shift silhouette. Solid colorway on a gauzy-crepe fabrication. Round neckline. Elbow sleeves with cold shoulders. Concealed zipper closure at back. Lined. Straight hemline. 100 percent polyester Lining: 100 percent polyester. Dry clean only. Imported. Measurements: Length: 20 in Product measurements were taken using size 2. Please note that measurements may vary by size. 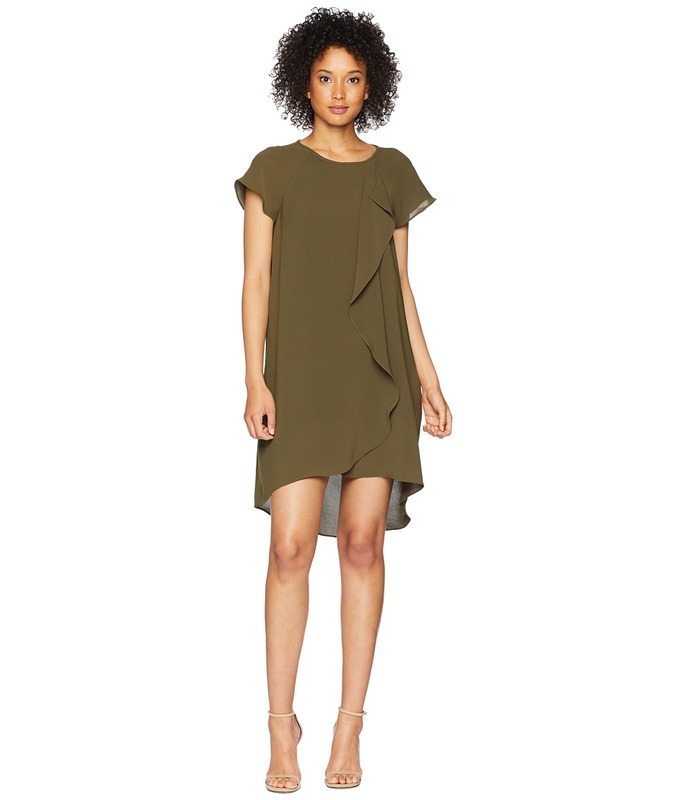 Elevate your style in this Adrianna Papell dress. Fit-and-flare silhouette. Bold stripes throughout a stretch-cotton fabrication. Hater neckline. Sleeveless. Dual hand pockets. Concealed hook and zipper closure at back. Lined. Straight hemline. 98 percent cotton, 2 percent elastane Lining: 96 percent polyester, 4 percent elastane. Dry clean only. Imported. Measurements: Length: 37 in Product measurements were taken using size 2. Please note that measurements may vary by size. 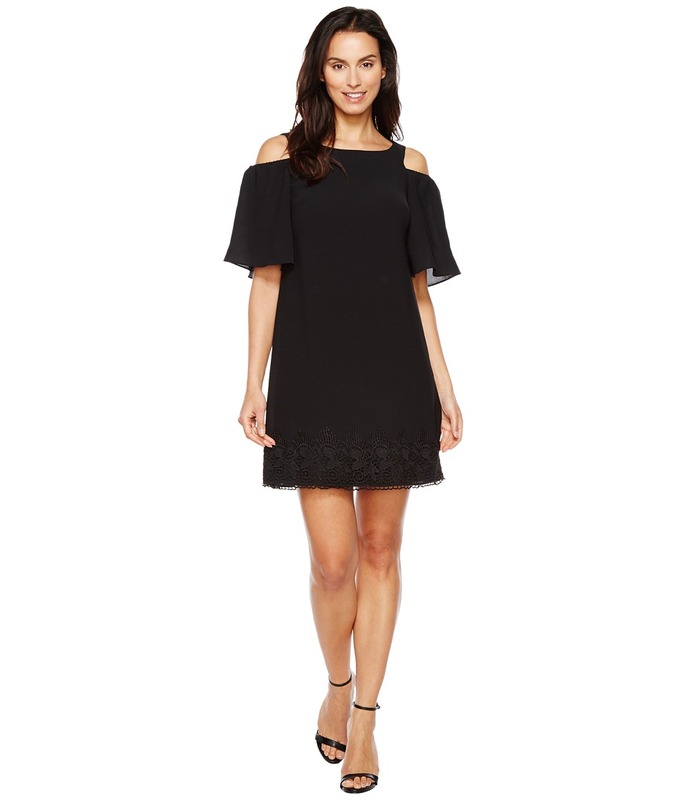 Make lasting impressions in this Adrianna Papell dress. Sheath silhouette. Tiered, shutter-tuck detail on a chiffon fabrication. V-neckline. Fluttered sleeves. Hook and zipper closure at back. Lined. Straight hemline. 100 percent polyester Lining: 100 percent polyester. Dry clean only. Imported. Measurements: Length: 36 in Product measurements were taken using size 2. Please note that measurements may vary by size. Make lasting memories in this Adrianna Papell dress. Fit-and-flare silhouette. Delicate solid colorway on an airy chiffon fabrication. Stand collar and V-neckline. Pleated ruffle detail at neck. Cap sleeves. Concealed zipper closure at side. Lined. Straight hemline. 100 percent polyester Lining: 100 percent polyester. Dry clean only. Imported. Measurements: Length: 39 in Product measurements were taken using size 2. Please note that measurements may vary by size.